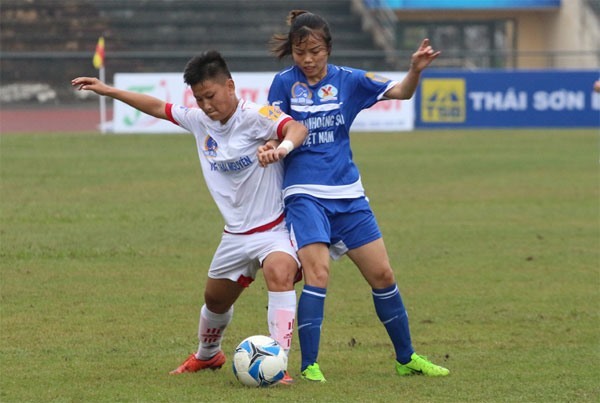 HÀ NỘI — Việt Nam Coal and Mineral defeated TNG Thái Nguyên 2-0 in round nine of the second leg of the National Women’s Football Championships Hà Nam Province on November 9. Việt Nam Coal and Mineral dominated the game from the moment the referee blew his whistle. They held attacks from both wings, causing many difficulties for Thái Nguyên’s defenders. In the 28th minute, Trình Thị Huệ opened the score for Coal and Mineral. Huệ’s goal motivated her team to play more aggressively in the second half. They had many opportunities to score another goal, but it was only in the 89th minute that they doubled the score to 2-0 thanks to Nguyễn Thị Trúc Hương. In the other game, hosts Phong Phú Hà Nam found it tough to complete against the enthusiastic playing style of Sơn La, however they managed to beat Sơn La 2-0. The two goals for the hosts were scored by Nguyễn Thị Nguyệt in the 42nd minute and Lò Thị Thành in the 75th minute. At present, HCM City 1 temporarily top the rankings with 21 points, followed by Phong Phú Hà Nam with 20 points and Việt Nam Coal and Mineral with 18 points. Eight teams are competing in a two-leg round robin tournament, with the top four teams after 14 rounds to go through to the semifinal, which will determine the two finalists.